Times tables can be tricky. 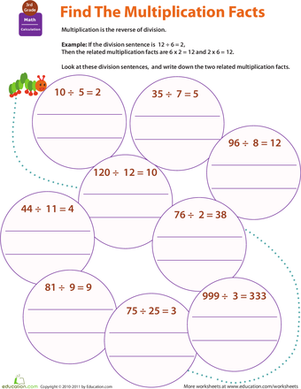 Help fourth graders master multiplication with these math worksheets. Give your fourth grader practice with an important concept: fact families. This one explores the multiplication facts that relate to division facts. 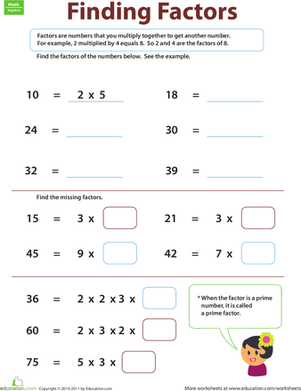 With this worksheet, your child will be learning about factors, and she'll be getting multiplication practice as she goes. Who knew that multiplication and addition were so closely related? Give your fourth grader practice with the concept, with this valuable worksheet. 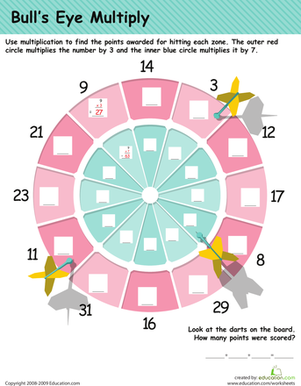 In this 4th grade math worksheet, your child will practice his multiplication tables as he calculates the points on a dart board. Challenge your fourth grader with 2-digit multiplication. Give him a hand practicing multiplying double digits by double digits with this ninja worksheet. 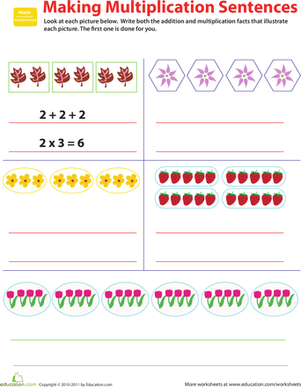 This worksheet is jam-packed with 2 pages of multiplication regrouping problems to help kids tackle two-digit multiplication. No reason to claim the dog ate your homework or an alien abducted your notes -- for this math assignment, you'll be the grader!